Virgin Air founder Sir Richard Branson warned about investing in dubious bitcoin trading schemes in a blog post on May 3, 2018. He advised people to not believe or invest their hard earned money in a cryptocurrency trading scheme that sounds too good to be true. There have also been several instances in the past where misleading advertisements posted online have shown the billionaire endorse such projects. The English business magnate repeatedly warned about the pitfalls of investing in get-rich-quick schemes. These advertisements generally try to lure amateur investors to dish out their money by painting a colorful background of the past returns of bitcoin. The fake stories are placed alongside articles of genuine news outlets or on their homepages to make them appear more authentic. These links then redirect to scam sites such as Bitcoin Trader which are shown to be endorsed by other notable personalities. 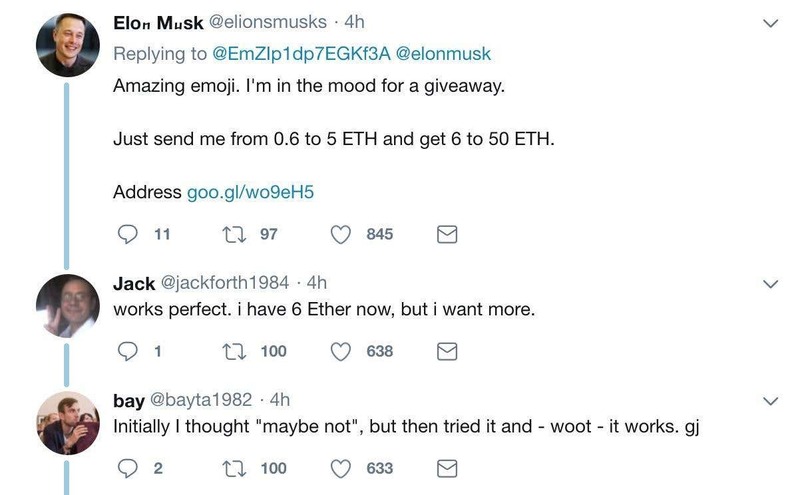 Elon Musk’s tweets were also targeted by fraudulent accounts promising bitcoin giveaways in exchange for an entry fee. Musk’s tweets would be replied to by several accounts impersonating him with the same name and profile picture. Such scammers often operate multiple Twitter accounts that retweet and like such tweets to boost their perceived legitimacy. Twitter announced that it would take steps to prevent further such instances in the future. “We’re aware of this form of manipulation and are proactively implementing a number of signals to prevent these types of accounts from engaging with others in a deceptive manner,” read an announcement from the social media company. In a policy update announcement on its website on January 31, 2018, social media giant Facebook announced that it would impose a blanket ban on all advertisements related to financial instruments, initial coin offerings (ICOs) and binary trading in the cryptocurrency ecosystem across its platform. Within the months that followed, Twitter and Google also announced their platform-wide bans against digital currency-related advertisements.